It also was equipped at some time with the No. 21 cupola that was at one time destined to upgrade the Chieftain fleet (but which was never adopted). The vehicle was completed in 1971 and after testing was used extensively as a sales platform for Chobham armour. The FV4211’s frontal arc was protected by thick panels of Chobham armour on the glacis plate and turret front, offering unparalleled protection against HEAT and armour piercing munitions. 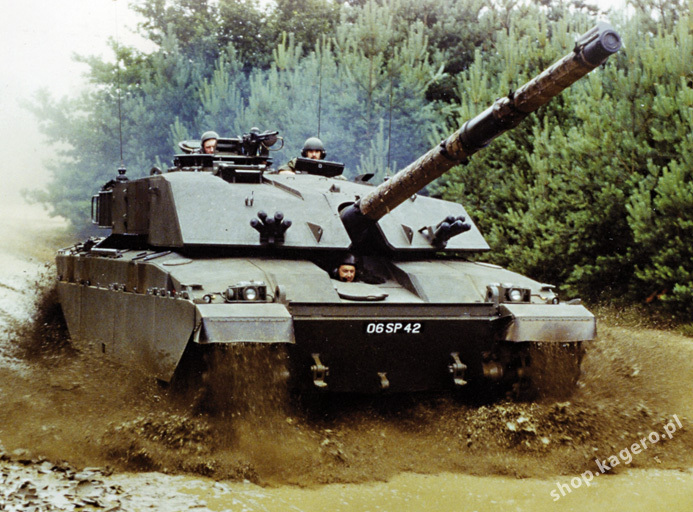 The features embodied in the FV4211 became the basis for concepts for a Chieftain replacement, although the basic design itself was too deeply rooted in the Chieftain design to adopt without changes. It would be the great expense of the new armour that would prove the greatest obstacle to its procurement by the British Army for several years to come. The year 1971 also saw the UK tank industry receive its biggest orders since the 1950’s heyday of the Centurion with an order for 780 Chieftain Mk.5 based tanks for the Imperial Iranian Army these would consist of 707 Gun tanks and the balance consisting of support vehicles such as the ARV and AVLB. The gun tank vehicles supplied were designated Mk.5/3P (with the P standing for Persia). They were similar to the standard UK Chieftain Mk5, but with an automatic gearbox to simplify driver training. The Iranians were very pleased with the Chieftain’s general design but had reservations about the troublesome L60 power pack, and this was to be reflected in their next order. Meanwhile in the search for a Chieftain replacement the UK entered into an agreement with the Federal Republic of Germany (FRG), and the two countries agreed to work on a design to be known as the Future Main Battle Tank (FMBT), which would replace both the Chieftain and the Leopard. Germany had already been part of the unsuccessful MBT70 program with the USA and the nascent Leopard 2 design was available to them as a fall-back, so one can imagine that the degree of necessary commitment to the partnership may not have been as great as may have been desired by the British. Problems quickly arose on different interpretations of each countries’ requirements, but design work began and proceeded, and several designs were produced, some of which were probably too advanced for the time. Although much that surrounded the Anglo-German program remains secret, one interesting design proposal prototype does survive in the Tank Museum at Bovington. Although it probably had an official designation other than CTR (Concept Test Rig), due to its shape it was and remains known as the “JagdChieftain”; due to its resemblance to the German tank killers of WW2. The decision to adopt a turretless configuration was probably influenced by the British Army’s testing of the Swedish Stridsvagn 103 S-Tank and by German experience with turretless AFVs like the Jagdpanzer Kanone. The CTR was constructed from standard Chieftain parts and was designed to have a 120mm gun in the sloping front plate, which was specified to be protected by a massive slab of Chobham armour. A standard length Chieftain hull was employed as the basis of the CTR, which might have performed better with a shorter track base. The CTR’s gun only had movement in elevation, so traverse was achieved by turning the whole vehicle in the target direction, which proved far less efficient than hoped for in tracking tests performed at Woolwich. The vehicle was configured to be powered either by the UK L60/TN12 power pack or the German MTU power pack (and doubtless would have employed the CV12 option had it been considered seriously for production in Britain). Although joint cooperation did not produce a Anglo-German Standardpanzer in the end, it did result in the decision that Britain’s future tank must follow a conventional turreted layout with a four man crew. The Anglo-German partnership did not endure, and with all the diverging doctrinal differences clouding the design, the project was cancelled by agreement of both countries in 1977. The designation FMBT did not drop there, and was continued as a generic term for a Chieftain replacement for a few years yet however.